Completed Project: Bruton White is gray. Super White is pretty darn white. The lampshade will be unpacked by now. Client MW is doing the downsizing thing. She has kept her most treasured objects and furniture and moved herself into a sunny, bright condo about 6 stories up. She’s in the treetops! I think Downsizing is a polite term for the sometimes gut-wrenching process of letting go, but M is no sissy. When we met at her new place, she was wearing her casual designer clothes, lavender eyeshadow, and 80+years extremely well. M, a collector of art, crafts and beautiful objects from everywhere, already knew she wanted to create an art gallery energy in her condo. She had already chosen Super White, a bright white with a slight gray cast for all the walls. We looked at a few others just to be sure: Chantilly Lace was too stark. Soft and warm Simply White felt too sentimental for this space. Decorator’s White did not make the cut. Super White won the day. 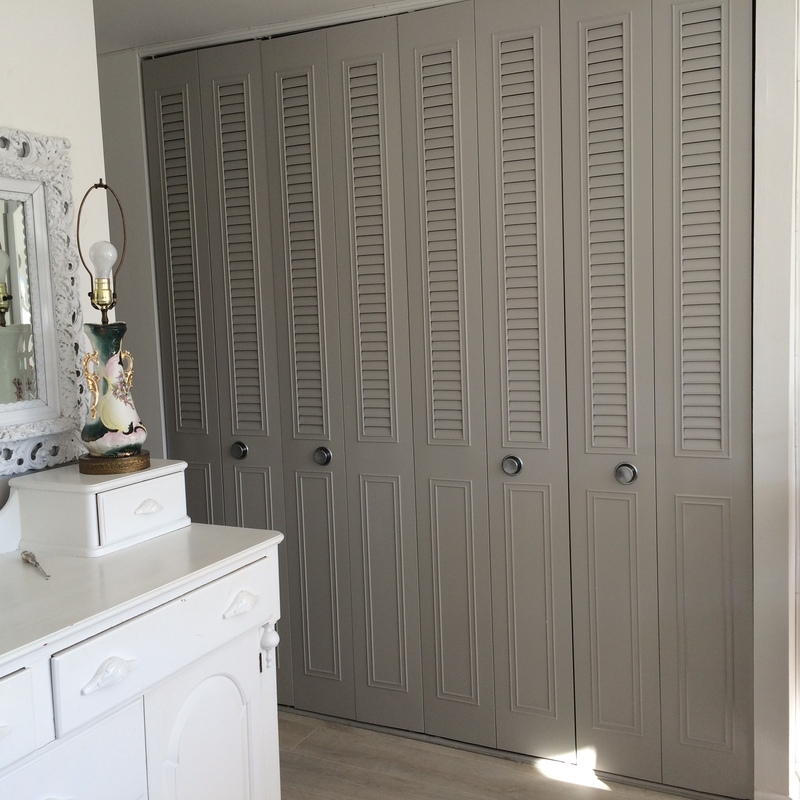 Next we needed color for the decorative doors that open on to several closets and a storage space. M had installed new flooring in a soft gray driftwood-color. To let the objets d’art be the main event in every room, keep a gallery feel but warm up the spaces, we looked at several grays for the doors. Bruton White is the solid, soft, warm grey that you see in the photos. So with all the white and warm gray on the walls and floors, I was hoping M would go for pops of color in the hidden spaces. My own personal eyes love it when I open a closet door and see a magenta or a bright aqua. Or when I walk into a bright orange laundry room. Seriously! 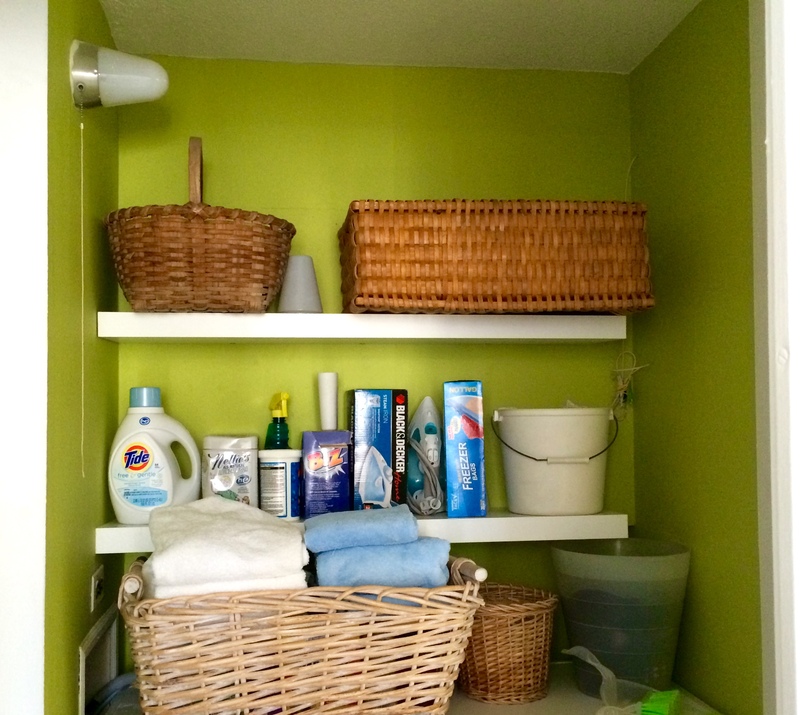 Completed: Laundry and closets in Granny Smith chartreuse. Yay! Painting your house before winter? Inspiration from Italy.